Castles you can only reach on foot have a particular attraction in today's car-dependant world. And castles on islands also have have a special character. 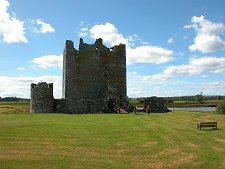 The mighty tower house of Threave Castle is doubly attractive. It is located on an island in the River Dee, a couple of miles west of Castle Douglas, and to get from the car park to the ferry you need to walk half a mile or so along good farmland paths. The castle comes with the added bonus of welcoming, enthusiastic and knowledgable custodians who double as ferrymen and who help add depth and atmosphere to your visit. 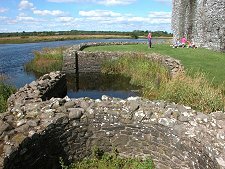 Intending visitors should note that Threave Castle is only open from April to September. The name Threave probably comes from the Old Welsh word Tref meaning "Homestead". This suggests settlement on the island at least as far back as the 500s, before the Old Welsh speaking residents of Galloway were displace by Gaels. 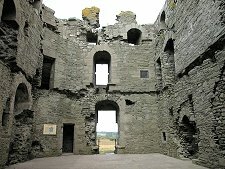 It is thought that Fergus, Lord of Galloway built a castle on Threave Island some time after 1000. Evidence is limited, but it is likely that this first Threave Castle was attacked and destroyed in 1308 by Edward Bruce, brother of King Robert I, after his defeat of the Gallovidians on the banks of the River Dee. In 1369 Archibald, 3rd Earl of Douglas, succeeded to the Lordship of Galloway. He is better known to popular history by the name given to him by his English enemies: "Archibald the Grim". 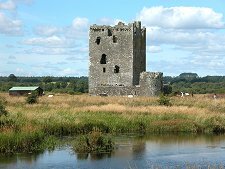 Threave Castle was built by Archibald in the 1370s to help secure his hold on Galloway and to resist incursions by the English. 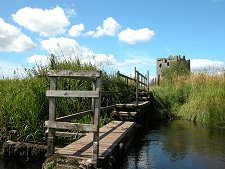 The impression you get today of Threave Castle is very misleading. When the castle was built the water level in the River Dee was rather higher, and Threave Island was only about a third of the size you see today. It is also wrong to think of the castle as an isolated building. As the photo of a Historic Environment Scotland information board below shows, when built it would have been the most secure and easily defended part of a village covering much of the the island. The large buildings close to the tower house would have been a hall and guests' lodgings complete with chapel. 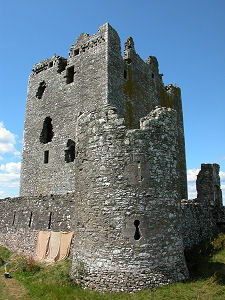 Threave Castle is unusual in the care taken to ensure it could be defended against a determined attack by a large force. Most of the floors are typical of those usually found in tower houses: a vertical stack made up of ground floor storage cellar and pit prison; mezzanine kitchen and reception room; first floor hall; and second floor private apartments. 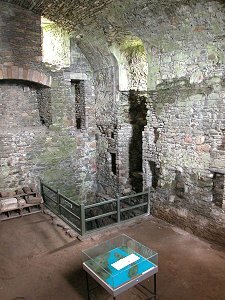 But what makes Threave unique is its third floor, a room designed to house the garrison in times of siege. 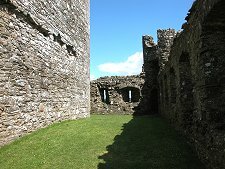 This was provided with a doorway through which weapons and supplies could be winched up from ground level, and nine windows for defensive fire. Immediately above it were the battlements, which would have been equipped with overhanging timber hoardings on three sides and an overhanging stone machicolation on the fourth, from which various unpleasantness could be dropped on any attackers reaching the walls. In the 1440s the 8th Earl of Douglas came increasingly into conflict with King James II following the execution of the 6th Earl and his younger brother by James. The King was a keen enthusiast for the latest continental artillery, so in 1447 the Earl of Douglas embarked on a major upgrade of the defences at Threave Castle. This involved demolishing most of the buildings on the island other than the tower house itself. Much of the stone was reused to build a sophisticated artillery defence, a lower wall around the tower designed specifically to withstand artillery and allow the defenders' guns to cover the now-cleared island. Outside the artillery defence was a moat flooded by the Dee. One of the three circular towers of this defence still stands, as does much of the wall that linked them. The part-funding of the work at Threave Castle by King Henry VI of England went down badly with James II, and the Earl of Douglas was murdered by James himself at Stirling Castle on 21 February 1452. The 9th Earl of Douglas, James, continued to resist the will of the King and in 1455 King James II decided to completely destroy this branch of the Douglas family. 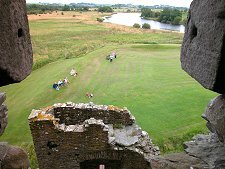 A three month siege of Threave Castle followed, which required the attendance of James. and most of his artillery. Parts of the artillery defence were damaged, but the final surrender of the castle owed more to bribery than to military defeat. The castle moved into Crown ownership, and out of the mainstream of Scottish history. In 1526 it was passed to the Maxwell family, whose main home lay to the east at Caerlaverock Castle. In 1640 the Maxwells' support of Charles I led to Threave being besieged by Covenanters (see our Historical Timeline). After holding out for 13 weeks the defenders surrendered with honour after intervention by Charles I himself. 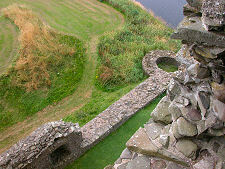 The still visible grassy embankment forming an outer ring around the castle was added to the defences at this time. 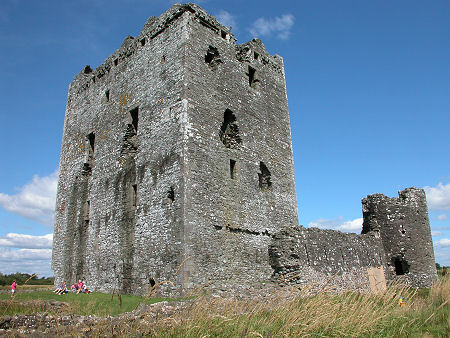 Threave Castle was slighted after its surrender in 1640, and apart from a brief period housing French Napoleonic prisoners of war, it was never again inhabited. In 1913 the owner, Edward Gordon, passed the castle into State care. Today it is cared for by Historic Environment Scotland.